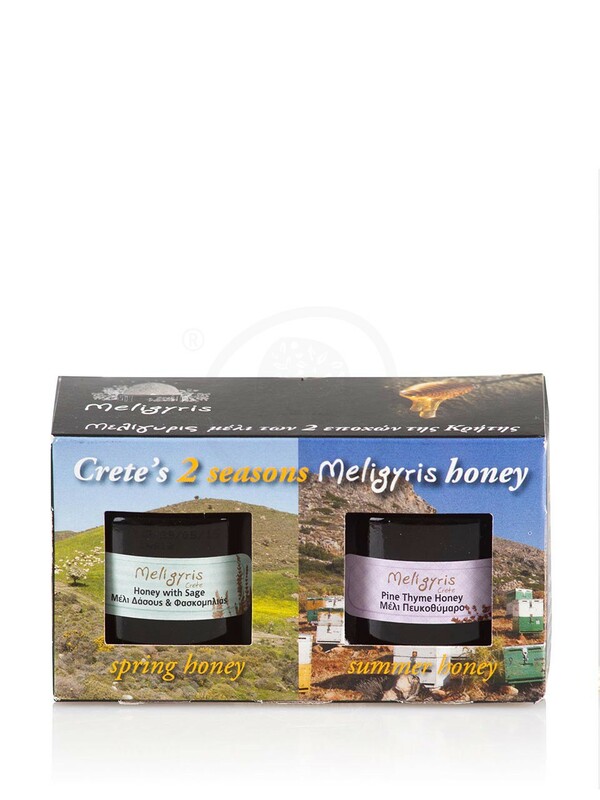 An elegant gift box with two small jars from two different varieties of honey from Crete: 1. Forest, Thyme and Wild Herb Honey (BIO): Certified organic honey, collected from swarms of bees, which don't move around, but visit the most gentle of herbs growing in spring, such as savory, thyme, sideritis, ebony and other forest plants. It is a light-coloured honey, with full-bodied flavour, rich in minerals and trace elements. It is considered a honey of high nutritional value due to the variety of substances that make up its composition. 2. Pine-thyme Honey from Crete: In Crete's ecosystem, the co-existence of pines with fragrant thyme creates the necessary conditions for the collection of honey with particular characteristics: amber colour, rich thyme aromas, intensity and authenticity in taste. Enjoy this honey in tea or in coffee instead of sugar, on slices of toasted bread, spread with fresh butter, as a topping over yoghurt or ice-cream, or as a healthy and nutritional snack with dried figs and nuts. References of honey can be found in ancient times, where it seemed to hold a special place in daily diet. Ancient Greeks believed that honey was the food of the Gods of Olympus (Nectar of the Gods). According to Greek mythology, Zeus was brought up with honey, by nymph Melissa at Diktaion Andron cave. Also, during the Byzantine period, honey was one of the main parts of the diet in monasteries. Today, the world-acclaimed Mediterranean Diet and particularly the Cretan Diet consider honey to be the main and healthiest sweetener. A symbol of fertility and well-being, the nutritional value of honey is undeniably great. Honey contains simple sugars which are directly absorbed by the body, making it a quick source of energy. It also contains vitamins and precious micronutrients. 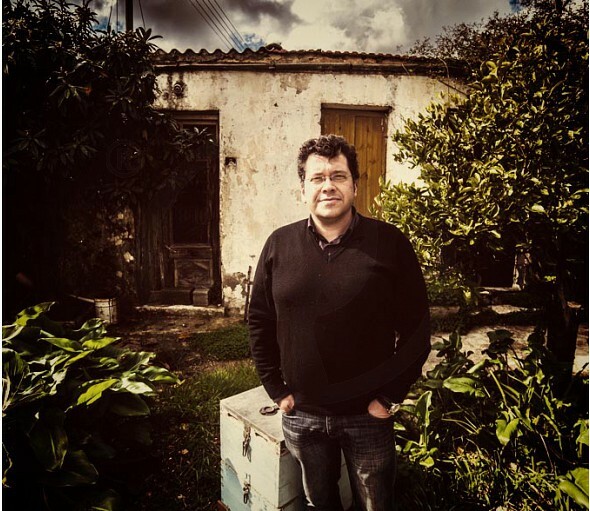 Having studied at the Agricultural University of Athens, and being brought up by a rural Cretan family with a beekeeping tradition since 1920, Manolis Stefanakis learned to love nature and respect its products.Showing respect to beekeeping, means, according to him, “not interfering with nature and allowing the bees to do their work without intervening.”His scientific training enables him to assess and highlight pure, natural honey. This means that he studies the microclimate of the mountainous regions of Heraklion, Crete. He also spots areas which are located away from agricultural crops, which provide the best organoleptic and biochemical characteristics, and that’s where he places his bee colonies. That’s how he gets the variety of honey that brings out the individual characteristics of each wildly grown herb.The special care and attention given to the method of collection, but also, the analysis and certification methods that he uses, guarantee a totally natural product of high nutritional value.Manolis Stefanakis is also one of the founders and members of the Scientific Community of Greek Beekeepers. Heraklion, Crete, is known for its centuries-old history and iconic natural vistas. Its sharp contrasts in terrain, its magical beaches and their diversity, its clement microclimate, and its archaeological treasures of worldwide fame compose Heraklion’s magnificent profile. All of the area of Heraklion is known for its one-of-a-kind landscapes: Rocky mountains dotted with caves and caverns, ravines and precipices, narrow trails and passes, tranquil beaches with crystal-clear waters, and a wilderness which is the habitat of rare flora and fauna. The history of the area begins in Greek Mythology with the birth of Zeus and continues with the development of the Minoan civilization which stamped the history of Crete as well as that of Europe’s. The Byzantine period follows, with Christianity spreading throughout the area. Venetian rule comes next, a historical period during which Heraklion rises to prominence becoming an economic power and a cultural hub, only to be followed by Turkish rule which lasts until 1898 when the island of Crete was liberated.Heraklion is the capital of Crete and the island’s largest city in southern Greece. 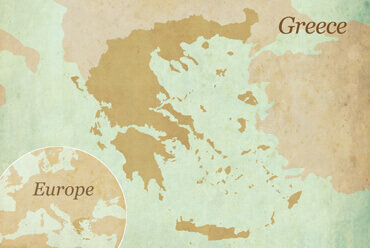 It is Greece’s fourth largest city and has one of the most significant ports in the Mediterranean. Since ancient times, Crete has been linked to the most evocative legends. The names of King Minos, of Ariadne, and of the Minotaur unravel through an endless yarn of myths. In all likelihood, Heraklion was named after Idaean Heracles, the mythical founder of the Olympic Games. The history of the area begins in Greek Mythology with the birth of Zeus and continues with the development of the Minoan civilization which stamped the history of Crete as well as that of Europe’s. The Byzantine period follows with Christianity spreading throughout the area. Venetian rule comes next, a historical period (1204–1669) during which Heraklion rises to prominence becoming an economic power and a cultural hub. Venetian rule is succeeded by Turkish rule which lasts until 1898 when the island of Crete was liberated. 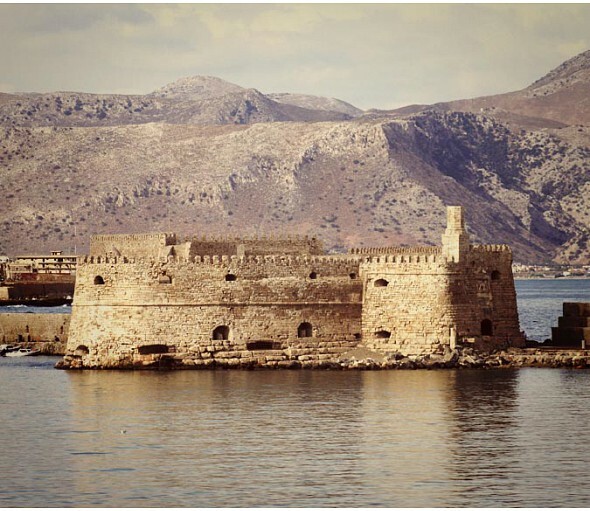 In 1898, Heraklion becomes part of the newly established Cretan State which, in turn, was annexed to Greece in 1913. Heraklion, Crete is known for its centuries-old history and iconic natural vistas. Its sharp contrasts in terrain, its magical beaches and their diversity, its clement microclimate, and its archaeological treasures of worldwide fame compose Heraklion’s magnificent profile. All of the area of Heraklion is known for its one-of-a-kind landscapes: rocky mountains dotted with caves and caverns, steep ravines and drops, narrow trails and passes, and tranquil beaches with crystal-clear waters never fail to captivate visitors. The wide diversity in flora and fauna on the island make for a varied Cretan fare of outstanding goods. Just like the rest of Crete, Heraklion is a blessed land where, the diversity in terroir, encourages various goods to thrive, showcasing those products’ sensory characteristics. Genuine flavors and wholesome local products compose the renowned Cretan Diet whose high nutritional value has rightfully earned it top ranking. We ship in the USA, US territories, Canada and Puerto Rico. For deliveries to other countries please select the option "Shipping To" and choose from the available countries. The shipping cost for orders will be calculated automatically in the shopping cart page or check out point, depending on each orderʼs address and volumetric weight features and will be included in your order request before the completion and payment of you. The amount will also adjust as you add, delete or change items and update your cart. Your order will arrive within 1-7 business days by UPS or USPS, depending on the kind of service you will choose, (Ground Shipping, 2 Days Delivery, Next Day Delivery). All of our in stock products are immediately shipped within the same business working day (Monday to Friday, excluding National Holidays) if order is placed before 17:00 CDT (UTC/GMT -5 hours). Orders can be also shipped to a P.O. Box or APO/FPO. In the case of P.O. Box, delivery will take longer than 7 days and in the case of APO/FPO, the delivery time is 4-6 weeks. Please note that all orders including perishable items are automatically shipped using 2 Days Delivery or Next Day Delivery (working days Monday to Friday) to ensure your product arrives in superb condition (Ground Shipping is not available as an option). Museum products (Not Food and Cosmetics) contained onto our e-shop are made to order and hand made in Greece. Those products are shipped, within 30 days upon ordered, directly from Greece and separately from the rest of the orders (food products and Cosmetics) that are directly shipped from our US warehouse at no extra transportation cost. We aim to provide 100% customer satisfaction. However, if you receive a wrong or faulty product, or in case of any other problem resulting from our fault, please contact our Customer Care team through the Contact us section immediately for further details.